Original Antique Maps and Prints. 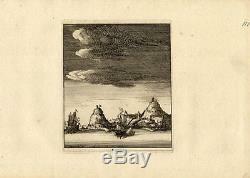 Description: This very rare old antique copperplate engraved print originates from:'Kleyne en Beknopte Atlas, of Tooneel des Oorlogs in Europa... , published in Amsterdam by David Weege, 1753. First and only very rare edition. This work is a reissue of an atlas published by Erven J. Ratelband en Compagnie, Amsterdam, 1735, enlarged with 25 maps / views. Including maps and views from earlier sources like Jacob Aertsz. 1635 and Daniel de La Feuille c. View of the city of Ceuta with ships. Ceuta is an autonomous city of Spain in North Africa surrounded by Morocco. Condition: Size (in cm): The overall size is ca. 27 x 19.5 cm. The image size is ca. 11.5 x 13.5 cm. Size (in inch): The overall size is ca. 10.6 x 7.7 inch. 4.5 x 5.3 inch. Medium: Copperplate etchings and/or engravings on a verge type hand laid paper. Watermark with the Amsterdam coat of arms. ThePrintsCollector Peter Cornelissen, Margo van Latum - van Dongen, Frank van Latum Zeeland - The Netherlands. We guarantee our items to be genuine original. GO TO OUR STORE and explore our huge collection of fine antique maps and prints. FIND SIMILAR ITEMS IN OUR STORE. Visit our Store: we would like to invite you to review similar items in our Store or to browse through all other items in our Store. We are confident that you will find very special unique antique maps and prints in our Store. It is our privilege to have you as a customer. The item "Antique Map-CEUTA-SPAIN-MOROCCO-AFRICA-SHIP-Weege-1753" is in sale since Monday, October 26, 2015. This item is in the category "Art\Art Prints".